Come to Tuscany if you want to live a very special holiday, one that will be incredibly beneficial to both your body and soul. This private beach-Italian paradise will become your favorite destination to rejuvenate your body and feed your soul with the immense beauty of seaside landscapes and Tuscan hills. You will be treated with meditation and yoga practices, beach sunsets, and stargazing. There will be two daily yoga and meditation sessions. Please remember to read the reviews to get a better idea. If you need a shorter/longer retreat or different dates, just send an inquiry to Lo Yoga so that they can adjust the package for you! Rooms are incredibly comfortable and luxurious in taste. All details have been carefully taken care of. Pure linen sheets, relaxing colors, en-suite bathrooms, mostly king size beds. You will spend a wonderful holiday with somebody whose main goal is to make you feel better, advance you in the yoga practice, rejuvenate your body through yoga and healthy food, and feed your soul with the amazing landscapes of one of the most renowned world destinations: Tuscany, Italy. Teaching style implies a lot of attention to each person needs and capabilities. Each yoga lesson will comprise flows but also study and practice of single more difficult poses. The aim is to transmit tips and details that will help anybody proceed in their yogic path. This is what happens: people get stronger and more flexible by the day and also advance in their yoga practice through tailored advice. Especially people that till today have felt inadequate or not good enough in other yoga schools or styles, here get more and more confident, more and more capable of reaching and keeping a pose. Bibbona and its surroundings are one of the most beautiful places on earth. Try this and you will come back every year, most people do. Certain landscapes are difficult to forget, and practicing with these surroundings will make you will feel the energy, the unity that we all look for. The schedule above does not apply on arrival and departure days, or on a sightseeing day which may have a different schedule. Sightseeing, if required, will be paid directly to the driver. Lorenza is a 200-hour certified classical yoga teacher, devoted to better understanding the human body, how it reacts to emotions and how to heal it through food, yoga, and meditation. Wellbeing and longevity have become her primary goal, both for herself and others. She is in love with Tuscany and its beautiful landscapes, and loves sharing its magical summer moments with people who love nature and silence but also music, dancing, and sports like SUP, biking, and hiking. Lorenza is also a gourmet chef, rewriting traditional Italian recipes in a healthy way. This retreat will take place in Bibbona, Tuscany, Italy. Bibbona is a wonderful little village on the Tuscan coast overlooking the Tyrrhenian Sea and the French island of Corsica. It is an incredible paradise, both in terms of landscapes and wildlife. The Mediterranean diet is the richest in nutraceuticals, which are key to living longer. Aside from swimming and walking, you can also go hiking, horse riding (on request), or cycling (free bicycles available), and SUP is also available. Tuscan Wellness Retreats can organize excursions on request or before or after the retreat only to Pisa, Siena, and Volterra with a little extra cost for the trip. All these are worth visiting, given that you will be in one of the most famous Italian regions in terms of historical heritage and natural beauty. You may also choose to fly into Pisa or Rome, so you can visit these two or Florence, which is only one hour away by train from the retreat location. You could also visit Portofino, which is just an hour and a half away by private transfer. Moreover, Lo Yoga can also help to organize sightseing to Pisa, Florence, Rome, Portofino, and Le Cinque Terre. Massages are available on request and for an additional fee. There is 1 complimentary homemade body scrub is included. You can buy Wellness and Beauty Packs with huge discounts before arriving. Kindly send an inquiry to Lo Yoga for more details. Please book your flight to arrive at Pisa International Airport (PSA). Alternatively, you can book your flight to arrive at Leonardo da Vinci International Airport (FCO) in Rome, at Milan-Malpensa Airport (MXP), or at Milan Linate Airport (LIN). The best one is Pisa anyway. Take a train from the airport to Cecina, Livorno. Loga Yoga can pick you up from Cecina. Your travel costs to Cecina are not included in the price of the retreat. 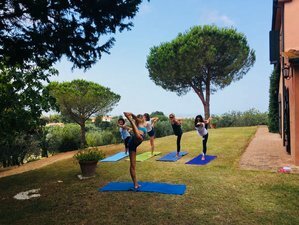 Lo Yoga offers yoga holidays in Italy, as well as nutrition and lifestyle advice to help you stay young and be in good shape. We have the luck of getting a lot more inquiries than the villa allows us to handle, so the deposit is non-refundable because Lo Yoga are always fully booked. The price below includes 30% last minute deal for the April retreat. Book now before it is sold out!